Bryanna Clark Grogan’s Vegan Feast Kitchen/ 21st Century Table: KUNG HEY FAH CHOY, SWEETHEART! 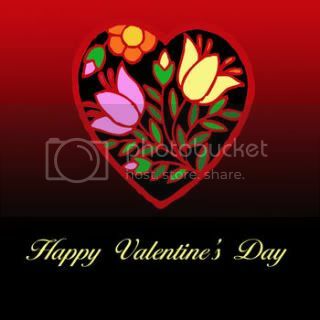 KUNG HEY FAH CHOY, SWEETHEART! 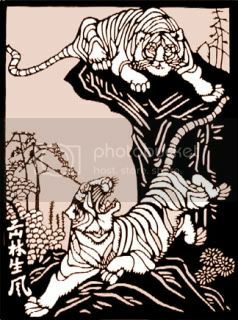 Yes, the Lunar New Year (which we usually think of as “Chinese New Year”)-- this year the Year of the Metal Tiger (DH's year), and it falls on Valentine's Day. I thought it might be fun to combine the two together, so, on Saturday, I'm hosting one of our vegan dinner parties, with five vegan couples all contributing to the dinner. It also happens to be one of our group's birthday (not mine!). I'm going to be cooking quite a bit in the next 2 days (and housecleaning! ), but check back for a post about the party. This is going to be a rather short blog post today, as it's getting late. We had a power outage today (wind storm!) and I haven't been able to get online all afternoon and evening until now. In all of these European cultures, great stock was put on various aphrodisiac foods, and almonds were one of those. It's convenient for our purposes on this double holiday that almonds are much used in Asian cuisines! The color red is associated with both holidays, which is also very convenient for us (for decorating purposes). Red is a good luck color in Asia, so you see red everywhere. The table for the feast is set with a red cloth and red candles. And, surprise, surprise-- it is traditionally a vegetarian feast, on the first day, anyway (the celebration lasts for several days). No meat is served because harm would have to be caused to obtain meat and this would be bad luck. While the grown-ups enjoy a long meal, the children play games and ask riddles. They usually also receive gifts of “lucky money” (lai see) wrapped in red paper envelopes. 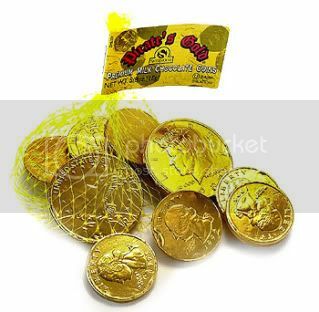 The giving of gold-wrapped chocolate “coins” is a modern-day custom, but one that serves our mixed holiday well, as chocolate is a well-known Valentine commodity (with purported aphrodisiac qualities). 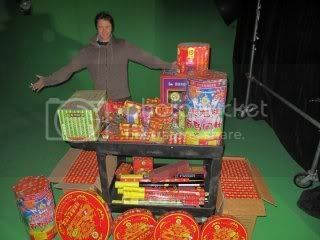 Fireworks are a big part of the celebration in China, but they're illegal here, so we'll have to make do with sparklers! The belief is that whatever happens on New Year’s day will influence the rest of the year, so everyone is very careful to say and do the right things, to think good thoughts and speak kind words. Visitors are offered gifts of sweets and fruit. The house is cleaned thoroughly and lots of food made ahead. Red and orange scrolls with Chinese characters conveying messages of good health, good, luck, long life, prosperity, and happiness, and flowers and pyramids of fruit decorate the houses. Oranges, kumquats and apples are the usual fruit, since apples are symbols of good luck and apples and oranges are both round (another lucky symbol) and are red and orange— colors of joy! (Apples are often known as “forbidden fruit” in Western mythology, which would add the requisite frisson of eroticism to the mixed festivities.) Sweet things are for the sweetness of life; dumplings and stuffed foods represent wealth; long, uncut noodles are for longevity. Lots room for creativity there! I had a tough time finding decorations in our small shopping area, but I managed to find some small paper lanterns, one big red and gold Chinese paper lantern, some of those little paper umbrellas, some sparklers, a paper dragon, and some gold-wrapped chocolate coins. I'm making some dark chocolate truffles with orange and ginger, and I found some red foil candy cups for them (they were all out of gold cups). These truffles will decorate an orange/ginger chocolate cake with chocolate/orange mousse filling and chocolate glaze. So far, I know we have a yuba dish, a rice dish, an eggplant dish and a noodle dish coming. 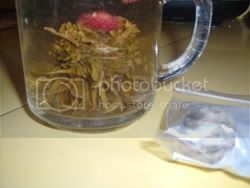 I'll make some plain rice, of course, and I have some flowering tea for a treat (read about it here! ), but I'm still trying to decide on the other dishes (besides the cake and truffles). Gyoza (potstickers), I'm pretty sure. Maybe "Buddha's Chicken" or "Buddha's Roast Duck"; maybe Lion's Head (a braised dish of "meatballs" and cabbage). Other possibilities (it depends on what I have in the house! )are: Pineapple Sweet and Sour "Pork"; Chinese Mushroom/Rice "Sausage"; Stir-Fried Vegetarian "Duck" with Chili, Bell Pepper and Black Beans (all these recipes are from my Chinese cookbook ). I should do something with almonds! On several sites I read that fresh tofu and other white foods (except for rice, obviously) are not served during the New Year's festivities because white is considered unlucky for New Year, as the color signifies death and misfortune.So I was thinking that you could use marinated or baked or smoked tofu, or bean curd skin (yuba) in your vegetarian feast. But Eve+line commented: "There is no such taboo about tofu or white colour food. In fact it's common to use tofu and other "white foods" (like radishes; scallops) in Chinese New Year dishes. However, we usually stir-fry or braise tofu with lots of other colourful foods so the white colour is not an issue at all. In fact it is traditional for Singaporean Chinese to have "steamboat" during the Chinese New Year Eve, and the meal will feature lots of "white food" like tofu, enoki mushrooms and meat dumplings." Perhaps it is different according to region-- I don't know. But I'm relieved that she wrote in about that! I'll be back in a few days with a report, pics and recipes! "I have to be honest and tell you that fresh tofu and other white foods (except for rice, obviously) are not served during the New Year's festivities because white is considered unlucky for New Year, as the color signifies death and misfortune." This is not true. There is no such taboo about tofu or white colour food. In fact it's common to use tofu and other "white foods" (like radishes; scallops) in Chinese New Year dishes. However, we usually stir-fry or braise tofu with lots of other colourful foods so the white colour is not an issue at all. In fact it is traditional for Singaporean Chinese to have "steamboat" during the Chinese New Year Eve, and the meal will feature lots of "white food" like tofu, enoki mushrooms and meat dumplings. Happy New Year and Gong Xi Gong Xi! Are you trying to use Cantonese or Mandarin? In any case, it's wrong. Such is the danger of celebrating a holiday that isn't yours. Also, a lot of the New Year traditions you mention aren't followed by the Taiwanese. It might help if you note that these are customs that might not be followed today, or if you note what region in China these traditions are followed in. eve+line, I'm relieved to hear that tofu is not a problem! Perhaps it is different in different regions. Anyway, I'm going to quote you when I amend that part of my post. #1) "Are you trying to use Cantonese or Mandarin? In any case, it's wrong." You only have to go online to find a number of different spellings, which are all phonetic. I grew up in San Francisco and always saw it spelled "Gung Hay Fat Choy". I thought the "Kung Hey Fah Choy" looked better, so I used that. One poster on the above forum writes: "I wonder why people don't spell Gung Hey (or Hay) Fat Choy the way it is actually pronounced in Cantonese. The way people spell it makes people say it like that. Well, I am hear to say you are not supposed to say Gung Hey (Hay) Fat Choy! I cringe and laugh when I hear people say it wrong or when I am watching the San Francisco Chinese New Year parade. It is a bit hard to spell it the way you say it but I hope the way I spell it here helps. "Goung Heyy Fought Choy" or "Goung Hayy Fought Choy." By the way, in my dialect, it is pronounced "Goung Hayy (or Heyy) Fought Toy. "...I am not sure if the spelling is right but it is much better then which you usually find." Another answers: "That's because English is not very alphabetic, especially with the vowel. 'Gung Hey Fat Choy' seems to be an attempt to read it somehow alphabetically. Consider 'u' as in 'pu' and 'a' as in 'farm'. 'Goung Heyy Fought Choy' would be an approximation from American English (I see from the 'fought'). I don't think you can be exact. 'Toy' sounds like Taishanese. " I'll repeat that poster-- "I don't think you can be exact. " #2)from Anonymous: "Such is the danger of celebrating a holiday that isn't yours." "Danger"?? Is it so awful even if I had somehow spelled it wrong, to want to learn about other cultures and religions? I'm from a mixed background, my children even more mixed, and my grandchildren still more mixed. We celebrate all sorts of holidays and we celebrate holidays in all sorts of ways. For instance, I'm not Jewish, but one year we did a complete Jewish Passover Seder-- even making the matzoh in under 18 minutes, which is the rule. Now, I know we weren't all kosher, and we probably didn't do everything properly, but my kids and I researched lots of Jewish cookbooks and we learned alot. We lived out in the "boonies" at the time, with no synagogue nearby and no internet then, so we had to do it that way. In any case, there are different Passover traditions, depending on Sephardi or Ashkenazim or Mizrahi Jewish customs, and also the country one is from. I'm sure that, for instance, the Muslim holiday Eid, is celebrated in at least a slightly different fashion in Indonesia than it is in Egypt, because their cultures are different. We have celebrated Muslim holidays, other Jewish holidays, Hindu, Sikh and Bah'ai holidays, the African-American holiday Kwanzaa, and more, as well as Christian holidays from all over the world. It's fun and you get great food and a learning experience, as well as teaching respect for all people. Our North American holidays and those celebrated all over the world are not all celebrated the same way, depending on regional and family traditions. We've celebrated Christmas Italian-style, Peruvian-style and French Canadian-style (all part of our family's combined heritage), and I often make Christmas and Easter breads from different parts of the world. I veganize them, of course, which might upset some purists, but I do it with a feeling of reverence for heritage and tradition. I think you need to look at this in a different way-- the world is going to be more "fusion" than ever in the future! Maybe I feel that way because I am not of one heritage only. On one hand I celebrate that, and, on the other, I want to learn about the customs of my heritages and others to keep them alive in some fashion. But change is inevitable and maybe that will save us from ourselves! #3 from Anonymous: "Also, a lot of the New Year traditions you mention aren't followed by the Taiwanese. It might help if you note that these are customs that might not be followed today, or if you note what region in China these traditions are followed in." I used Chinese sources, and perhaps some of them are old-fashioned, but I'm not writing a university thesis on the subject here! I'm, sure the traditions are different all over China, as well as in other parts of Asia. ***I'd love to hear about traditions and customs from all over China, Taiwan and the Chinese diaspora, as well as other Asian cultures that celebrate the Lunar New Year, but I hope it will be positive and informative, and not so critical, please. Did you delete my last post? Yes, I did, and I'll delete one again if you continue to call me "ignorant" and sneer at me. You're entitled to your own opinion, but this is not a blog for arguing or disrespecting anyone. I would remind you that many non-religious people born into Jewish, Christian, or whatever, families, continue to celebrate religiously-based holidays with their families without partaking in the religious side of it. Christmas is an obvious case in point. I am well aware that these are not just "food holidays", but since food is so important in them, they offer an opportunity for learning while cooking with children. 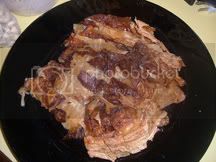 You know darn well we didn't make matzoh "under rabbinic supervision"-- I said as much myself. That wasn't the point. My children and I studied why matzoh is eaten and why it is quickly made. We studied the story behind it's use and the different types of matzoh used in different regions of the world. So, sue me! Your argument that one must take part in the prayer, fasting, etc., in order to learn about a holiday from another culture or religion does not hold water. Should we not study about other cultures in any way that we can, especially as hands on as we can? We need to learn more abut one another in this world, not stay separated! Discussion is fine-- argument for argument's sake is a waste of everyone's time. Trying to write Cantonese or other Chinese dialects phonetically is always problematic. We have a "problem" in Singlish (our local patois) too, but it's not something to kick up a big fuss over. As long as we understand each other, that's cool. I'm Hainanese and we say "kung hee fatt sai". Since I can't speak it very well, I'm probably pronouncing it wrong, but it's the thought that counts. More importantly, I am not saying some curse words inadvertedly! Pineapple tarts - pineapples are called Ong Lai in Hokkien and it sounds like "good fortune come"
BBQ pork or bak kwa - not sure about this one. I'm sure the red and golden colour have got something to do with it! Anyway, the Lunar New Year season is always hazardous to the waistline. The eating starts days before and will continue for the next two weeks. Wan Shi Ru Yi (万事如意） meaning may everything go according to your wishes! Actually, in a multi-cultural society like Singapore, we celebrate all sorts of festivals - chiefly by eating! The office culture of sharing food in the pantry is prevalent and it's common to find buckets of goodies when major holidays approach. Of course we don't do sheep sacrifice during Eid (we call it Hari Raya Haji here) or do oil baths during Deepavali (although a large number of Chinese Buddhists DO go to Hindu temples for prayers with the Hindus). To us it is sufficient to know that our friends and colleagues are celebrating something special in their religions, and we help by sharing the workload when they're busy with their preparations. It helps that we get public holidays too! I leave the celebrations to the believers concerned. They do not expect us to partake of the religious ceremonies too. They do, however, appreciate an acknowledgement and good wishes and more importantly, CONSIDERATION during their celebration (e.g. do not call them back for work when they're celebrating). For food, it is always a happy thing to be able to munch on goodies like murukku and keropok. Oh dear I'm getting hungry already... I haven't even started cleaning my house yet and it is tradition to spring clean! Geez, what a rude visitor. As for the pronouncation and whether or not it's right or wrong, it is the sentiment that counts, not the exact pronouncation. Besides, it's different in different dialects as pointed out above. I am having a huge mental block since I haven't celebrated with my family in several years, but we always had tangerines, candied fruit, wrapped candy and chocolate coins. If I can recall correctly, I believe there was also candied lotus root. One dish I do remember my family making was stirfried mung bean noodles with vegetables. It's served room temperature with lettuce pieces and you use the lettuce as wrap for the noodles. I guess it is different for people from different regions, but they did/do still serve meat during celebrations. Anyway, ignore the negative poster and have a great Lunar New Year! I think it's great that people embrace other cultural celebrations. Thank you, Eve+line and ms. veganorama, for your recollections and observations, and, especially your good wishes and positivity! The cake is almost ready, the table is set, decorations up, and gyoza stuffed! Bryanna, I just want to take a second to write that I'm a big fan of your blog and to thank you for it. We had a simple reunion dinner last night, just a vegetable dish, a chicken dish and rice. However, it was nice having the whole family (all three of us) together on the Lunar New Year Eve as my mother and brother do shift work. Happy Chinese New Year! I prepared lots of noodle and dim sum recipes! My kids loved it! It is their first time to celebrate it with them! For the record, "gyoza" is the Japanese term for dumpling, Chinese people call them "jiaozi". Or if you're pan-frying them, "guotie" (鍋貼). Yes, I'm aware of that, anonymous. 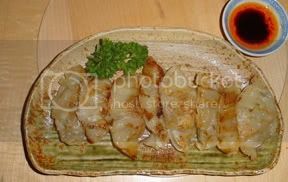 In Vancouver, they are referred to as gyoza even in many Chinese restaurants, such as Legendary Noodle. Interesting discussion, and thanks for your boundless creativity Bryanna! I love the fabulous variety you provide all of us interested in plant-based cuisine… it sounds like some posters may not be aware that your audience is already worldwide! I can’t wait to try your gyozas! OF COURSE what one consumes is never a solely personal choice... it is influenced by many societal and cultural complexities. Bryanna, I'm sure that most people who follow your blog can tell that you are already a very politically aware, and sensitive individual who shares your knowledge thoughtfully. Vegans, of all people, know what a challenge it can be to step outside the boundaries of 'tradition'! We are certainly not all 'light skinned' and many of us experience being seen as an 'affront' to the 'authenticity' of our own cultures of origin by simply daring to eschew meat from our menus! As a person of mixed heritage myself, I love the opportunity to learn about traditions different from my own and their various expressions through the celebration of food. By demonstrating how healthfully and deliciously it is possible to practise compassion AND environmental awareness through a plant-based diet. Keep those cross-cultural inspirations coming, Bryanna! Bryanna, I'm sorry you had to deal with that kind of crap contributed by a visitor who wasn't brave enough to show us his/her name. Who said "ignorant"? 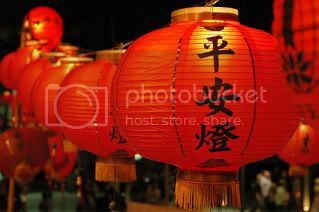 Happy Chinese New Year to you, and thank you for your wonderful blog and positive contribution to veganism. Blase, I appreciate your zeal for justice and equality, which I share, but I'm afraid that you (and the anonymous poster) have made many incorrect assumptions about me, my family heritage, education, and economic status. You don't appear to have read my own comment and those of others on the spelling of the New Year's greeting. And you really need to review what you wrote in your 4th paragraph about the people of Appalachia. I'm available via email if you want more discussion. Blase, I want to point out that meat consumption is considered a sign of wealth worldwide. Most peoples of the world live on rice and corn because they can't afford meat (and perhaps for other reasons of which I may be unaware). I doubt they identify as vegan. Sure, there's a difference between people who eat organic brown rice and those who eat cheap white rice. In the US, it is considered a "luxury" to eat prime rib, etc. Poor people who eat cheap hamburgers feel like they're doing "OK" economically as long as they can have some meat on the table. It's a sign of having "made it." Blase, even though you have a great vocabulary, your paragraph makes no sense-- unlike Sheryl's, I believe, who was very gently pointing out to you the unfairness and, again, incorrect assumptions you were making about an entire group of people about whom, I suspect, you know nothing. I don't like the aggressivenes of your tone towards Sheryl and will end comments on this post entirely if it doesn't stay civil. As I said before, please review that statement and think on it. Obviously, I'm not the only one who saw the contradictions in it as you reprimanded me for being found wanting in the sensitivity department. Respectfully, we are going to end it here. This is not a forum to discuss vegan ethics, or whether we are all perfect vegans, etc.. (Some of my readers are not vegans, and they are welcome here, shocking as that may be.) This is a COOKING blog. There are lots of other venues for the type of discussion you obviously desire. Funny that you separate out the US from the rest of the world in response to my use of the term "worldwide." And funny that you use the term "those people" to refer to people with whom you are unfamiliar. I understand about cultural appropriation, which some folks here appear to be accusing Bryanna of, but you seem to imply that no one should even bother to try to learn about cultures other than their own, saying "we just can't understand." For example, I'm deaf. You can learn about my language and my culture and understand deafness. You may or may not be able to fully appreciate what it means to be deaf because you're not, but does that mean you shouldn't learn what you can, if you're motivated to do so? The tone of Blase Kearney's original post is outrageous. I seriously doubt that Ms. Grogan, who claims Peruvian and Persian ancestry (as well as others) and who goes out of her way to educate herself about and embrace the world's cultures needs to be lectured to like that. Ms. Grogan is a long time vegan and an innovator and author in vegan foods. A brief perusal of this blog would make those things clear and I would suggest that Blase Kearney do a little research and a lot of thinking before she takes someone to task like that in the future. Thanks, Veghead! One correction,m though-- my dad was, indeed, Peruvian, but I can't claim any Persian ancestry, just a great appreciation for a rich culture.